There are many reasons why people collect antique horse jewelry. For me, one of the things that’s really amazing is when you’re able to identify the maker of a piece of fine antique horse jewelry. Learning about the person who made a beautiful bracelet adds an extra level of enjoyment to owning and wearing it. 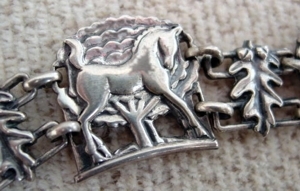 Take this beautiful sterling silver horse bracelet by McClelland Barclay. It’s an amazing piece of horse jewelry all on its own. Finely detailed, with four exuberant foals rendered with all of their youthful grace and energy, it’s the type of fine horse jewelry you’ll want to wear everyday.This piece is signed by the artist. At 7 1/4 inches long, it’s sized to fit fairly closely. This is an important piece of antique horse jewelry by an American Master. McClelland Barclay was a fascinating man. An extremely talented artist, he did a tremendous amount of work for the publishing and advertising industry in the 1930’s. You can see a lot of his work here. (His wife was his model for much of his work, including the famous “Body by Fisher” series.) Basically, every major magazine of the period featured his work. McClelland Barclay didn’t limit his creativity to illustration. He made lots of fine jewelry, some of which is likely to be of interest to lovers of antique horse jewelry. Barclay is extremely collectible – even though he was a prolific artist and designer, his untimely death in World War Two means there’s only so much wonderful jewelry out there. Barclay used a few different signatures on his work. 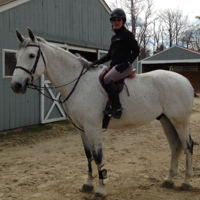 Talk to your favorite horse jewelry retailer about what you should be looking for when you’re searching for McClelland Barclay horse jewelry.